5 Star Auto Glass has served Vienna, VA, with windshield repair and auto glass replacement services for over a decade. Our Vienna customers are safety-conscious drivers and want their installation completed to industry standards by an experienced technician that takes the time to complete the job right. Need our on-site service to your workplace at Navy Federal Credit Union Headquarters? Not a problem. Or is it to your residence off Chain Bridge Road? We have you covered there, too! Best of all, it’s at no additional charge for replacements or repairs! Answer: We only use advanced-cure adhesives, so our wait times are the fastest the industry offers and are a fraction of the time of conventional-cure adhesives. For most vehicles, it’s just one hour. If you need to drive almost immediately after, we offer Xpress30, a 30-min SDAT (safe drive-away time). While some ADAS sensors/cameras are attached to the body of the vehicle, most are attached to the windshield. In most cases, it can be identified by the clear triangle/trapezoid portion of the “tinted” area at the top of the windshield, as seen below. 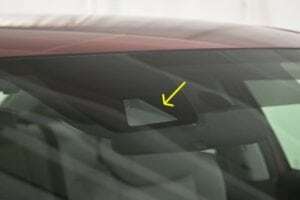 Some auto manufacturers have begun coining these features – Honda Sensing, Subaru Eyesight, Mazda Smart City Braking.